I grew up eating tofu and never quite understood why people didn’t like tofu and call it gross and nasty. 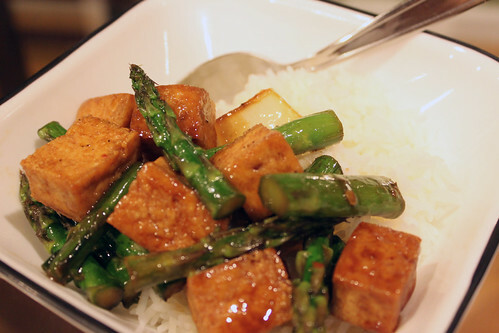 Tofu is one of most versatile foods to cook with, tasty if prepared right and really good for you. 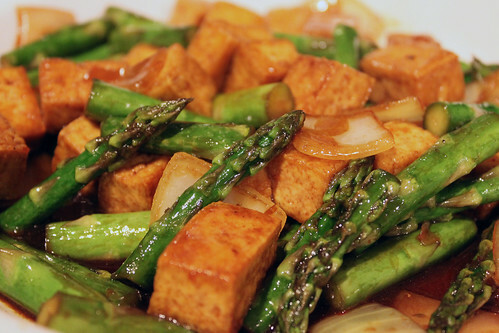 Tofu is also low in calories, low in fat, contains iron and packed with 8-9 grams protein per 3 ounce serving! Jane and I were out and about after I got home from work Friday night and we came home starving. Times like this, I rely on quick and easy stir-frys so we can eat PRONTO! For this stir fry, I made a quick hoison/soy sauce. 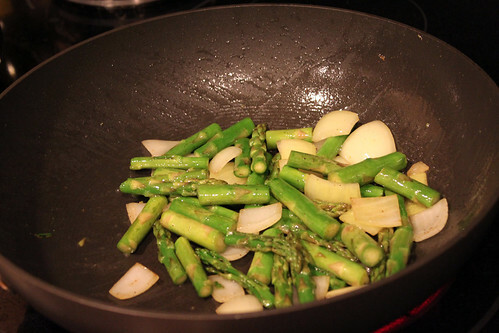 When asparagus is in season, I like to steam asparagus, and dip the asparagus in hoison sauce, so I figured it would be a good idea to make a quick hoison/soy sauce for this stir fry. Within 20-25 minutes, dinner was served. To save even more time, you can buy tofu that is already cubed and fried and have dinner within 15 minutes! 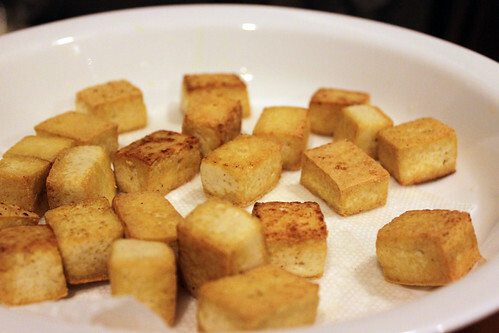 Open Tofu container, pat dry with paper towel, cut into cubes and set aside. Cut asparagus into 2-inch pieces and onions and set aside. In a small bowl, whisk soy sauce, hoison sauce, rice wine vinegar, sesame oil, chili garlic, and black pepper. You can add a little sugar if it is too salty for your taste or add salt if you like it saltier. 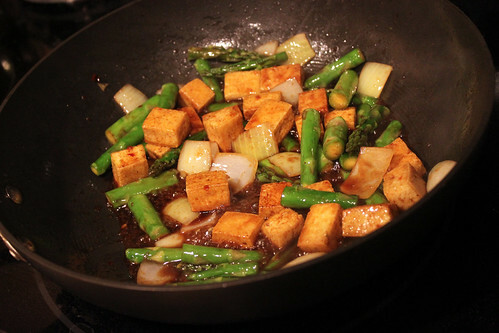 Heat wok over Medium-High heat, add 2-3 tablespoons of oil and fry the cubed tofu pieces until brown on all sides. Transfer to a plate with napkin on it to drain excess oil. If there is still too much oil in the pan, you can pour some oil out and return wok to stove on HIGH. Add asparagus, onion, garlic, and 1 tablespoon of sauce. Stir fry for 2-3 minutes. Add tofu to stir fry and add remaining sauce (or less if desired) and stir fry for another 1-2 minutes.